See also: Farmers' Alliance; Fusion of Republicans and Populists; Gideon's Band; Red Shirts; South Dakota v. North Carolina. The Populist Party, also called the People's Party, led a dramatic and temporarily successful revolt against Democratic Party rule in North Carolina during the 1890s. Its origins can be traced to the growth of the Farmers' Alliance and the rise of anti-Alliance sentiment within the state Democratic Party. Prior to the spring of 1892 the Farmers' Alliance, led in North Carolina by Leonidas L. Polk and his Progressive Farmer, worked primarily within the Democratic Party to advance its agenda, including regulation of railroad rates, fairer taxation of railroads, and increased aid to public education. Thwarted attempts by the Farmers' Alliance to dominate the state Democratic convention in May 1892, however, proved disappointing to many Alliance members. Their failure prompted the first manifestation of organized Populism in North Carolina: on 18 May 1892, at a meeting in Raleigh, adherents selected delegates to the upcoming national Populist convention. In July, after a national convention of Democrats nominated Grover Cleveland for president, some North Carolina Alliancemen who did not participate in the earliest meetings of the party declared their intention to vote for the Populist presidential nominee, James B. Weaver. However, these men planned to remain Democrats for political purposes. Their plan collapsed in early August, when the state Democratic Party chairman, Furnifold M. Simmons, banned Cleveland's opponents from receiving nominations for state and local offices. With support for Cleveland as the measure of Democratic loyalty, the bond between the party and many former Alliance members, sorely tested since May, was broken. North Carolina Populists held their first nominating conventions in early and mid-August 1892 and developed a full slate of candidates for state office. They adopted national Populism's Omaha Platform, which endorsed government ownership of railroads and a federally controlled money supply. On state matters, the party demanded a 6 percent limit on contract interest rates, full taxation of railroad property, and encouragement to education, agriculture, and manufacturing. Together, financial, transportation, and educational reforms-the leading tenets of Alliance ideology-became the rallying cry of North Carolina Populists. The Populists' first campaign ended in disappointment. The party captured fewer than 50,000 votes, about 17 percent of the total, and won more than 35 percent of the vote in only six counties, all in the east or eastern Piedmont. This setback resulted from two factors: the decision by many Alliance members to remain in the Democratic Party and the failure of the state's strong Republican Party, the overwhelming majority of whose members were black, to support the Populists. Although the first problem proved impossible to reverse entirely, the balance of power in state politics shifted in early 1893, when Populist and Republican leaders began to plan a cooperative strategy for the next election. The goals of the union were to forge a new majority with Populist votes, repeal Democratic laws restricting access to the ballot, and give the General Assembly control over local government. The leading Populist behind "Fusion," as Democrats termed the Republican-Populist agreement, was Marion Butler of Sampson County. In 1893 and 1894 Butler conducted repeated negotiations for cooperation. By the 1894 Populist nominating convention, practically all party members endorsed cooperation with Republicans for legislative offices and continued support of traditional Populist reforms. The so-called Fusion was successful, as the 1894 election sent 60 Populists, 56 Republicans, and 54 Democrats to the 1895 General Assembly. Three Populists won election to Congress. During the 1895 session Butler and Jeter Pritchard, a Republican, were elected to the U.S. Senate. The Populist state representatives also achieved demonstrable change. Various Populist-inspired reforms were enacted, including a new election law, local government democratization, and a 6 percent interest law. The 1895 General Assembly was the legislative high-water mark of Populism. After 1896 the party began to decline. 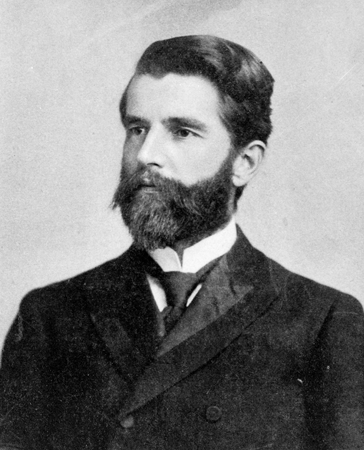 A major reason was growing internal factionalism between Populists and Republicans, which was exacerbated in the 1897 General Assembly and undermined much of the Fusionist administration of Republican governor Daniel L. Russell Jr. According to the party's 1896 platform, all Populists stood for financial reform, public control of railroads, free elections, and better schools. However, some lawmakers, who were very attached to Republican allies, failed to use their power in the General Assembly to achieve their party's goals. The Fusionist legislature of 1897 was an unmitigated disaster, as Populist members split into pro-Republican and anti-Republican camps. In addition, Populists were not ideologically or politically prepared to meet the violence of the Democrats' white supremacy campaign. Although Populists had always claimed that Democrats used racist rhetoric to stifle reform, the party was composed primarily of former Democrats committed to white supremacy. Many eastern Populists were uncomfortable cooperating with black men and left the party because of the issue. Although Populists managed a respectable campaign in 1898, it was overshadowed by the well-orchestrated brutality of their opponents. Democrats, partly through the employment of terrorist groups known as Red Shirts, physically assaulted and intimidated Populists before and on election day. Their strategy worked, ending Populist-Republican rule in the General Assembly. In 1900 Democrats resurrected the violence of 1898, passed the disfranchisement amendment, and once again gained control of state government. The state Populist organization collapsed immediately, although some local units persisted for a short time. Bitterness toward Democrats among Populists was so strong that a large faction of the party faithful, partly attracted by the reform rhetoric of Theodore Roosevelt, defected to the Republican Party after 1901. Many former Populists became third-party members again in 1912, joining Roosevelt's Progressives. These ex-Populists were always a minority among North Carolina Republicans in the first decades of the twentieth century, and they never fully controlled party policy. Some historians believe that a form of Populism endured in Randolph County, Sampson County, and other places, evidenced by "islands" of strong Republican support throughout much of the Democrat-controlled twentieth century. Durden, The Climax of Populism: The Election of 1896 (1965). James L. Hunt, Marion Butler and American Populism (2003). "Politics and populism." LearnNC.org. http://www.learnnc.org/lp/editions/nchist-newsouth/7.0. "The North Carolina election of 1898." The North Carolina Collection, University of North Carolina at Chapel Hill. http://www.lib.unc.edu/ncc/1898/1898.html. Wormser, Richard. "Populist Party." The Rise and Fall of Jim Crow. http://www.pbs.org/wnet/jimcrow/stories_org_populist.html. Butler, Marion. Addresses of Marion Butler, President, and Cyrus Thompson, Lecturer, to the North Carolina Farmers' State Alliance, at Greensboro, N.C., Aug. 8, 9, and 10, 1893, at its Seventh Annual Session. Raleigh, N.C.:Barnes Bros, 1893. Beeby, James M. Revolt of the Tar Heels: The North Carolina Populist Movement, 1890-1901. Jackson:Univ. Press of Mississippi, 2008. Delap, Simeon Alexander. "The Populist Party in North Carolina." Historical Papers Published by the Trinity College Historical Society Series XIV. Durham, N.C.:Seeman Printery, 1922. Thompson, Cyrus. "Dr. Thompson's Great Speech: a large and representative gathering of Populists of Sampson and adjoining counties at Clinton, N.C., Aug. 19, 1898, to hear the opening of the Populist campaign." [s.n.] 1898. http://digital.ncdcr.gov/u?/p249901coll37,17251 (accessed December 6, 2012). Photograph of Marion Butler. Image from the State Archives of North Carolina. Call number N_70_6_33. 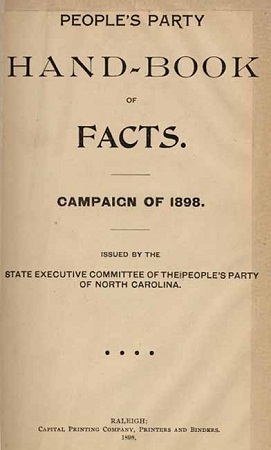 Title page of the People's Party Hand-Book of Facts. Campaign of 1898. Raleigh [N.C.]: Capital Printing Co. 1898.